Add fun owl figures to your garden with this Songbird Essentials Retro & Blue Owl Bird House Combo. This set of 2 adorable, wooden and metal shelters brings a whimsical hint and a bit of personality to your yard in moments. Each home sports a wooden front and back panel, along with a metal, diamond plate body, creating a rustic roosting spot. Overlapping metal and wooden discs form large, expressive eyes on the Retro Owl Bird House, and raised dowels here evoke eyebrows and a nose. A 1.125" diameter opening beneath this face enables wrens or chickadees to roost in this home. The soft blue hue and raised wing shapes on the Blue Owl Bird House further celebrate your feathered friends, and the triangular wood beneath the large eyes on this unit mimic a beak. This home also has a 1.125" diameter entry near its base, and a back cleanout panel on both shelters allows for nest checks. Hang these homes from their included rope loops, for easy and versatile placement. The wood and metal construction remains durable and lovely, while the owl figures add a conversation piece to your setting. 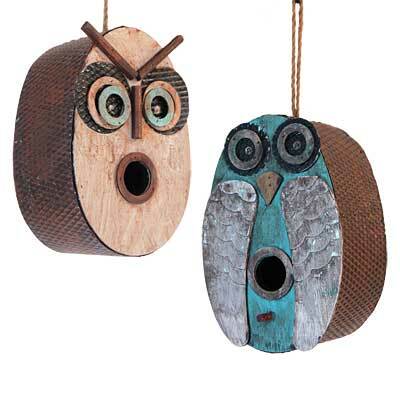 Showcase your love of owls and songbirds with this Retro & Blue Owl Bird House Combo.